Tama links to the Times Online “50 best Robot movies” today. Of course, I have my own reservations about the list (although I am very distracted by SF robots that have only appeared in print, and often don’t think so much about those on film), but the main thing that interested me was looking at all the comments. There were so many little arguments over what belongs in the category “robot”, and just so many people who were absolutely sure they were right and everyone else was wrong! The classification of something as a robot/android/droid/drone/cyborg(/human/person/animal) is obviously something that I mull over pretty much every day, and I still haven’t really found an answer. Mind you, I’m not really looking that hard as I don’t think one exists, at least not in any clearcut way. It made me smile, though :-). In particular, when I realised that noone had yet mentioned the origin of the word robot, and the fact that in Capek’s play, R. U. R., the robots were assembled out of organic material. That’s always an interesting spanner in the works when trying to clarify the differences between robots, animals and humans. 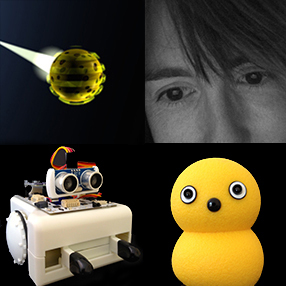 In this blog's profile image I appear with Keepon, Sparki and Chris Lynas' depiction of a drone from Iain M. Banks' Culture. The photographs of Keepon and Sparki are my own and the drone image appears courtesy of Chris Lynas.